Welcome to El Palacio Damasceno. 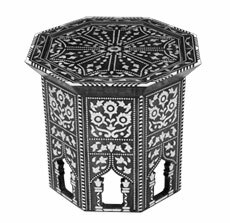 Here you will find our outstanding and charming collection of furniture designed in the traditional Syrian way and crafted using only the finest materials and craftsmanship. 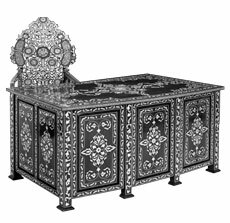 Syrian furniture is very distinctive and instantly identifiable because of the consistency of walnut wood and the traditional Arabic decoration. 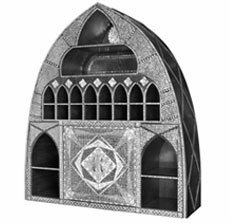 Till today, the Syrians use the most basic tools and the age old art of Intarsia or inlay of fine mother of pearl, that makes their oriental furniture all the more mesmerizing and spectacular. The Syrian culture is not only rich in Islamic Art, but being at the cross roads between Africa and Europe, the country has adopted many traits from the cultures of both continents as well. One cannot help but fall in love with such a rich history and culture. 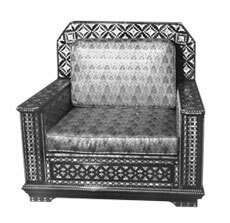 The heritage comes to life as soon as you lay your eyes on a piece of Syrian furniture. 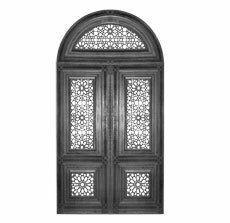 This craftsmanship is integrally embedded in Syrian culture, with the techniques used in creating works of art being handed down from generation to generation. No machine can ever produce something remotely close to the craftsmanship displayed by the Syrians in their creations. This edge held by the Syrians over the machine is because of their ancestral expertise in handicrafts and handmade artefacts. The furniture making art begins with well dried walnut pieces being cut to a rough shape resembling the shape of the finished product. A skilled artisan then gets to work to form highly complicated patterns using the dried walnuts. 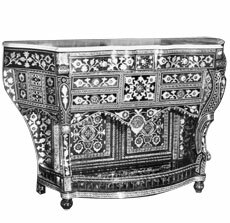 Next, the mother-of-pearl pieces are precisely cut and polished to fit firmly and perfectly in the carved hollow spaces in the walnuts. Naturally, all these steps demand attention to detail, precision, and honed skills to positively influence the final outcome of the finished product. 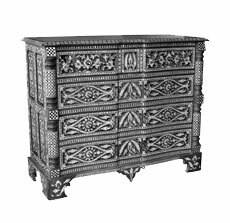 When the resulting final product takes the shape of the furniture, it is sprayed with high quality varnishes to protect and preserve the delicate mother of pearl as well as the exquisite walnut wood. 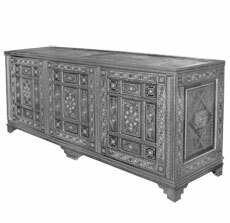 There are many factors which contribute towards the price of Syrian furniture - the complexity of patterns, the total time spent in making them, the quality of mother of pearls, the type of walnut wood used, and the overall curves as they are particularly very difficult to manoeuvre and require a lot of time to finish. 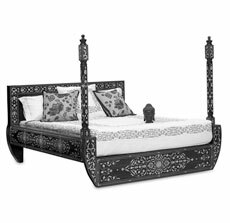 The demand for Syrian furniture is as popular with the art lovers of today as it was in the pre-machine era. The Syrians take pride in the fact that each masterpiece they create is one of a kind and unique, and whenever you lay your eyes on their creations, you cannot help but admire the devotion and efforts that were put in to create this master piece. 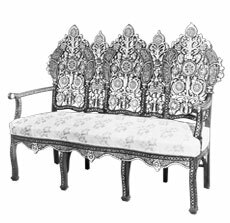 We at El Palacio Damasceno take pride in offering the historic marriage of Islamic Art with the culture, tradition and ideas from Africa to Europe in the form of Syrian furniture. So, view our inventory to see what we have in store for you. If you do not see something you would like or if you would like more information, you can contact the El Palacio Damasceno team on +34 9113 999 72.